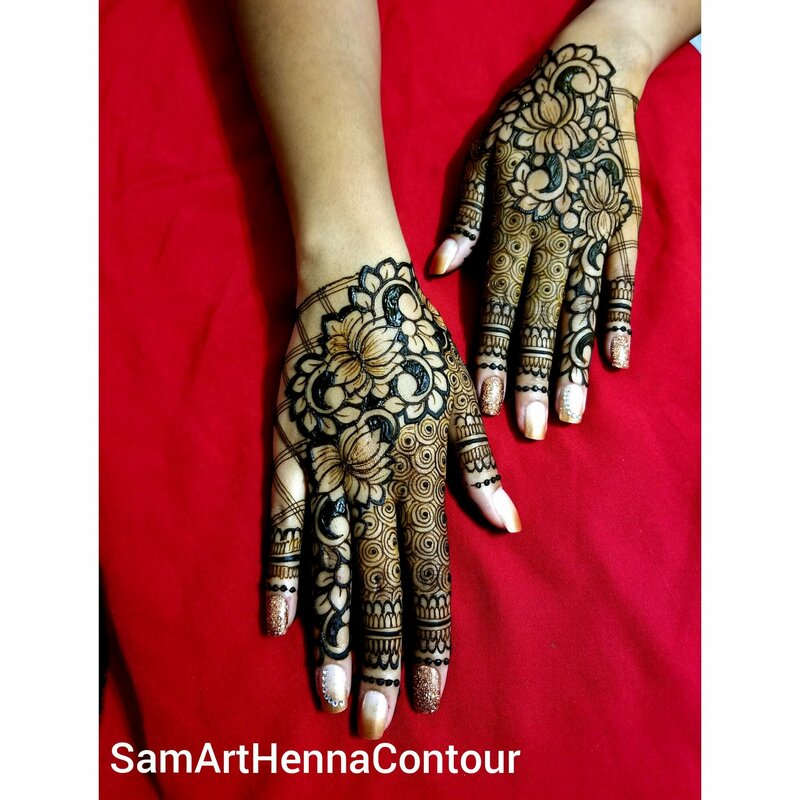 Committed to making your Bridal Henna experience cherish able for years to come. My brides choose from a wide range of bridal design options, from simple to intricate, from traditional Indian to trendy Indo-Khaleeji Fusion. I specialize in creating a unique design for you including details from your love life to add a spark of romance, aka "Henna Love Stories." All packages include complimentary simple matching feet henna. I would love to incorporate Bride/Groom (Raja/Rani) Figures to give your mehndi, a touch of elegance and royalty, for all packages. There might be a travel charge depending on your location. on arms and legs (details below). Coverage is categorized as how high would you like to wear your henna beyond your wrist and ankle. Intricacy is categorized as "traditional" and "bespoke/intricate rajhistani" henna. Traditional package covers indo-khaleeji, indo-arabic, Jewelery, AshKumar and simple Rajhistani (includes bride, groom, elephants, peacocks, musical instruments, Shri Ganesh, OM etc) style Henna. Bespoke/Intricate Rajhistani package caters to the brides, who would love to wear their love story and/or intensive figure work or super intricate Pakistan's Famous Kashee's style henna (aka. Bohri). You will get unique personalized design based on the details of your love life including skylines, landscapes, Monograms, symbols, dancers, bidai bride, palki and much more. This package caters to a traditional bride who wants to go above and beyond on her wedding day. 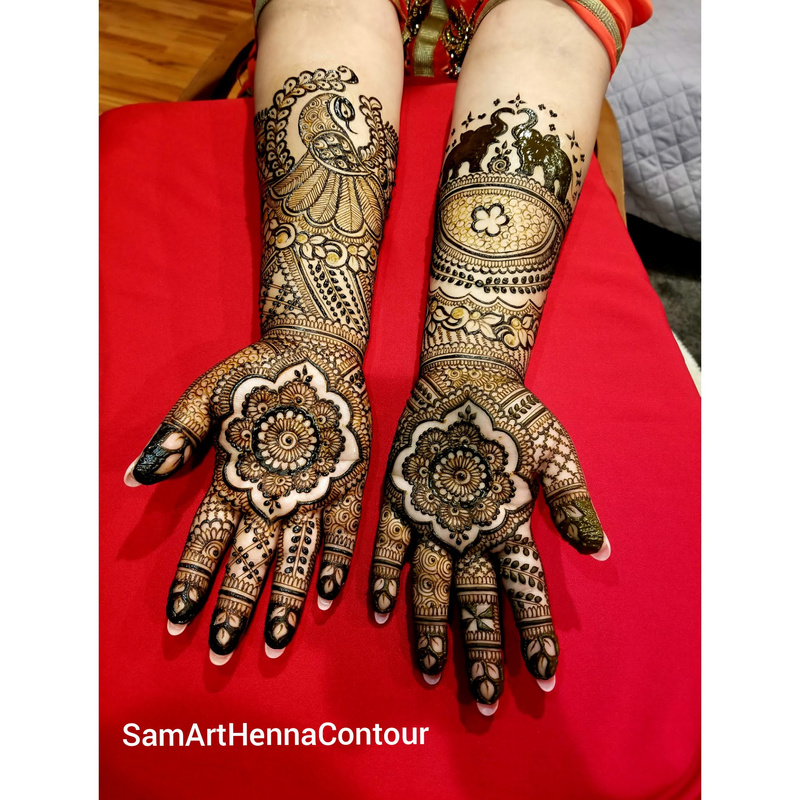 This package offers traditional or Bespoke/Intricate rajhistani henna designs on both the tops and bottoms of your hands extending to 4 inches beyond the elbow with matching simple complimentary feet henna. This package caters to a traditional bride who wants to shine on her big day. 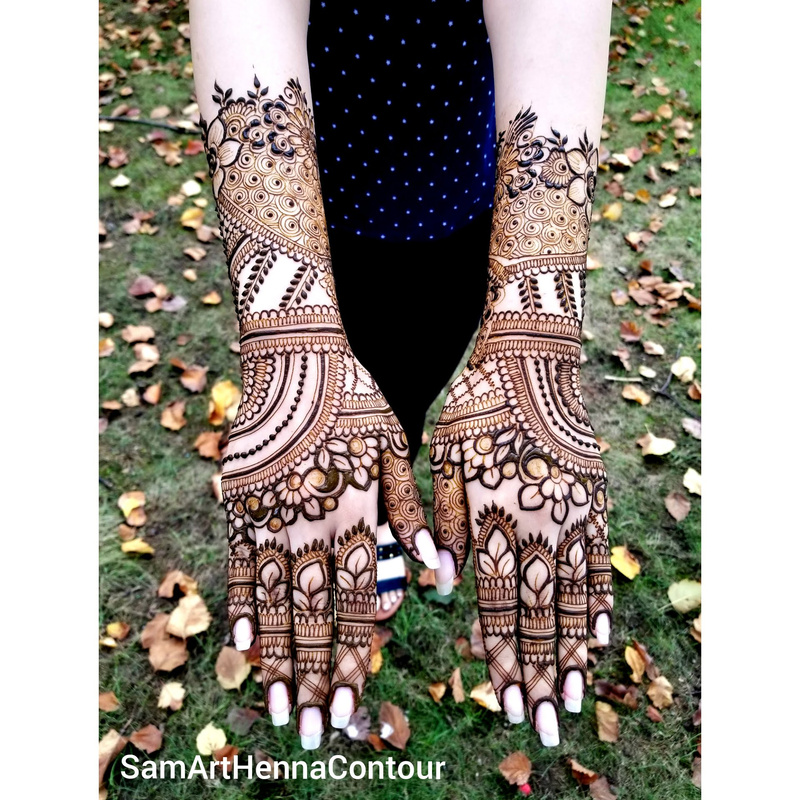 This package offers traditional or Bespoke/Intricate rajhistani henna designs on both the tops and bottoms of your hands extending to 2inch beyond the elbow with matching simple complimentary feet henna. If you are henna and bangels lover and want to slay your wedding week and beyond with your beautiful bangles and a henna design past your bangles, Chodda gap package is a perfect match for you. You will get henna till wrist with a 2 to 3 inches band around mid-forearm height or where your chodda/bangels set finishes. Package includes henna back and forth on your hands/arms with complimentary feet henna. Perfect for the classy bride who wants to adorn her arms till her elbows. 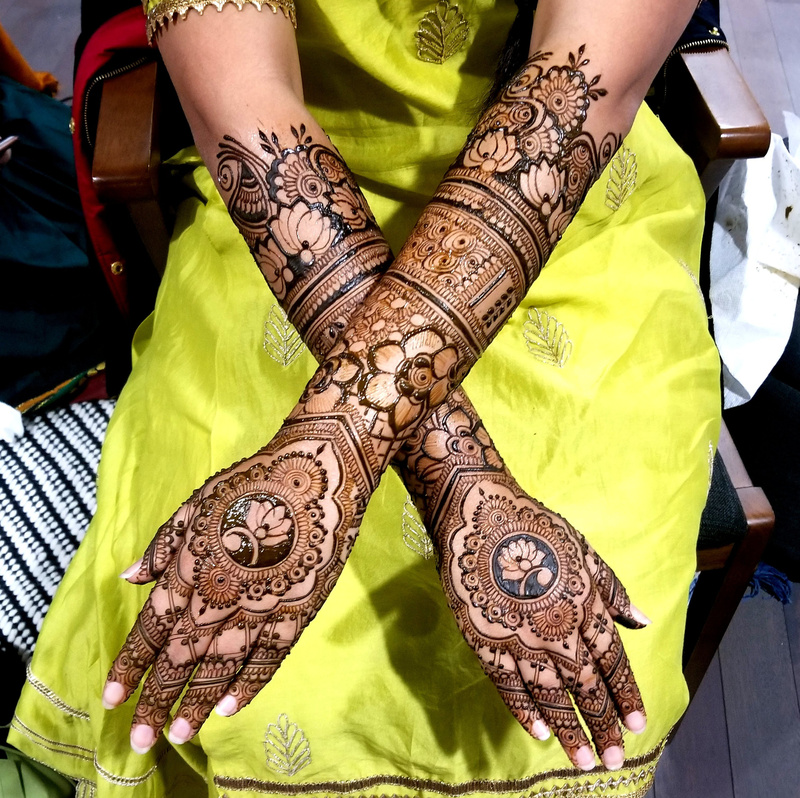 This package offers traditional or bespoke/intricate rajhistani henna designs on both the tops and bottoms of your hands extending to just below the elbow (upto 8 inches beyond your wrist) with simple complimentary matching feet henna. 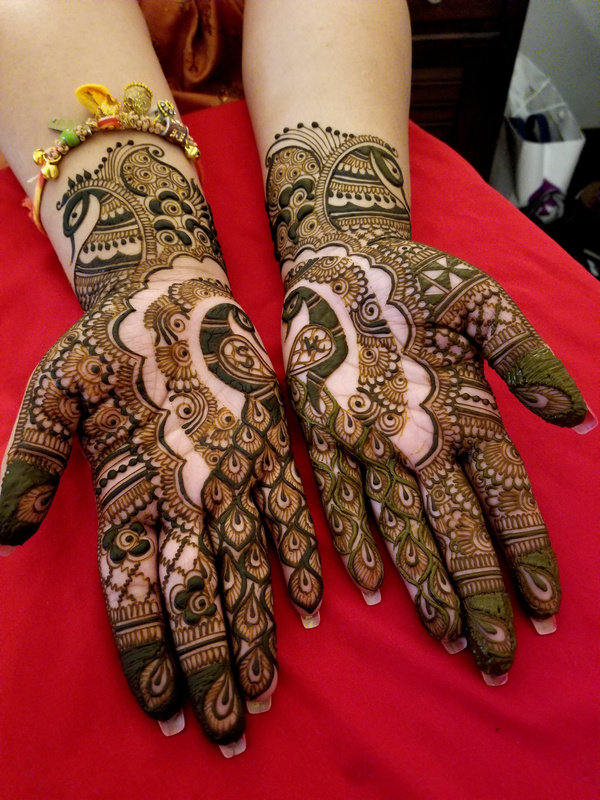 This package offers traditional or bespoke/intricate rajhistani henna designs on both the tops and bottoms of your hands covering up to 3/4 of your arm (6 inches beyond your wrist) with simple complimentary matching feet henna. Have your henna mid fore- arm. 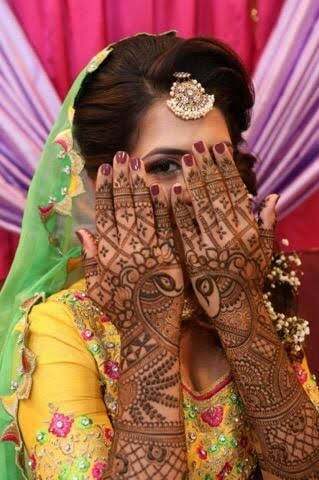 This package offers traditional or bespoke/intricate rajhistani henna on palms and tops of your hands extending approximately 4 inches beyond the wrists with simple matching complimentary feet Henna. This package caters to the bride who wants her henna a little down then wrist line. 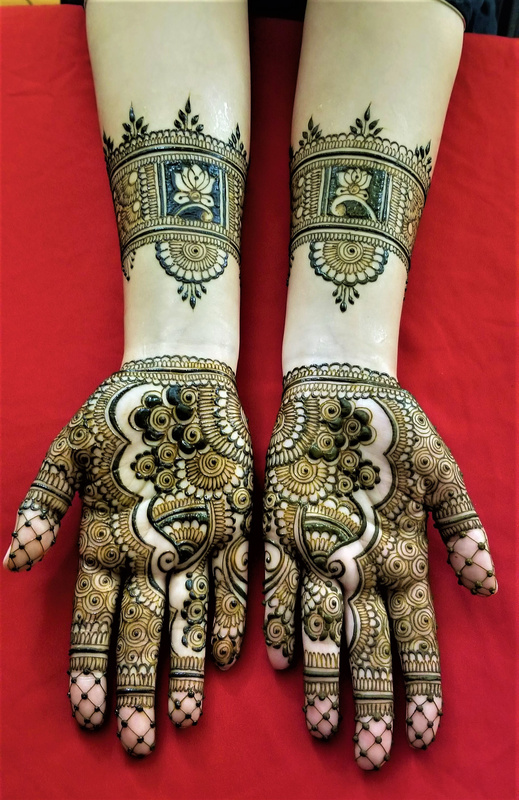 Enjoy traditional or bespoke/intricate rajhistani henna on palms and top of your hands, up to 2inch beyond the wrist with simple matching complimentary feet henna. This package caters to the bride who feels that less is more. Enjoy traditional or bespoke/intricate rajhistani henna on tops and bottom of your hands exactly finishes up to the wrist with matching simple complimentary feet henna.